A hand can transmit a virus quicker than a sneeze. Just one door contaminated with a virus spreads germs to about half the surfaces and hands of 50% of employees in the office within four hours, according to a study at the University of Arizona, in Tucson*. While proper hand washing and sanitising can help in reducing transmission, both methods require active participation by users. A sanitised door handle, automatically sanitises hands without requiring users to take action. 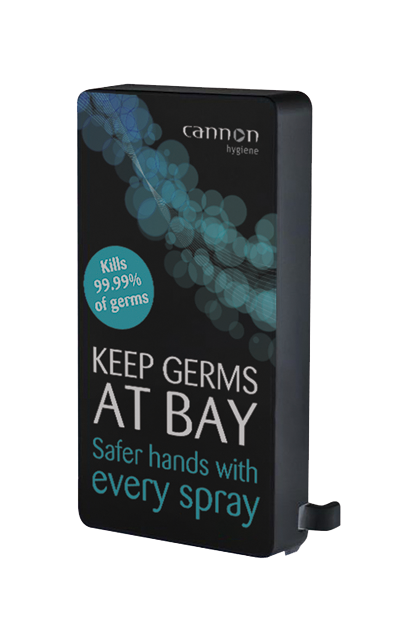 Cannon Hygiene has just launched CannonTouch, an effective, fast acting door handle sanitiser, which kills 99.99% of germs in 30 seconds. Easy to install, the sanitiser sits above the door. Sanitiser spray is activated once the door closes. The spray protects against microbial recolonisation for at least 24 hours and has a residual action on skin for up to 6 hours. CannonTouch supports risk management and compliance regimes as well as helping to reduce cross-contamination and absenteeism. The system, which has been on trial in a number of hospitals has already received positive feedback. We will help you maintain and present the best facilities through our range of managed washroom services and hygiene solutions. Through our unique approach we ensure your washroom is hygienic, healthy and running smoothly. We pride ourselves on delivering best-in-class service that is right for you. Our team of hygiene experts will advise you on the most intelligent solutions for you and the users of your washroom Read more…. Uma casa de banho limpa e higiénica diz muito sobre a sua empresa. Mostra que aplica igualmente os elevados padrões a todos os aspetos do seu negócio e que dá prioridade à higiene e segurança dos seus colaboradores e clientes. Escolha a Cannon Hygiene e poderá dispor dum serviço de excelência mundial para a sua casa de banho. Leia mais…. Cannon Australia – A high quality, well maintained washroom helps create a good impression of your business amongst customers and staff. In a world where good impressions count far more than they ever used to, end users have come to expect the same level of cleanliness in public washrooms as they have in their own private bathrooms at home. But for any busy organisations operating in today’s fast paced 24/7 world, it could be fair to say that the washroom is low on the list of priorities. Read more….